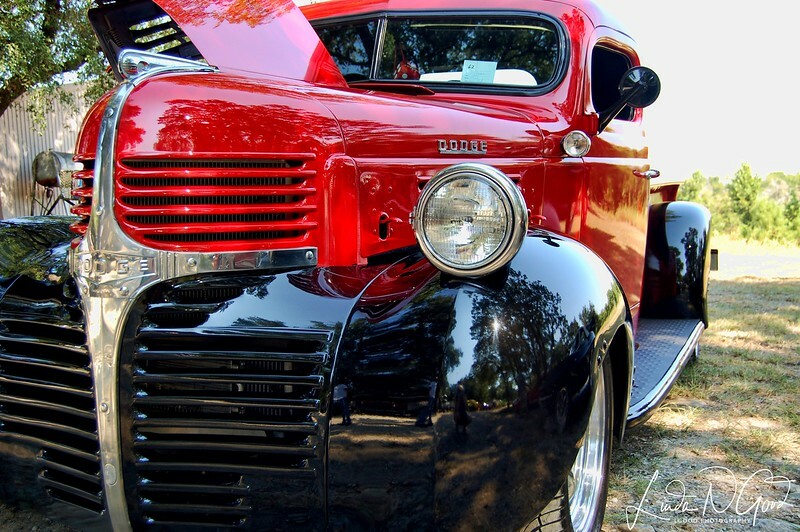 This 1941 Dodge Pickup Truck is a true beauty. I dare say that it’s perfection and certainly better than when it rolled off the assembly line. You can see my SP in the fender. I wasn’t able to comment on any photos Saturday as we had a house full of company which wasn’t conducive to taking the time to do so. My apologies. They all went home yesterday afternoon, so I was able to get on line then. Thank you for your comments and commentaries. Much appreciated. Have a “shiny” and great day today! OH WOW LOVE THIS RED TRUCK! It certaily looks immaculate !! It must give the owner a great deal of pleasure after spending a lot of time, effort and money, to come up with an astonishing showpiece like this one is !! Superb shot !! Love this. Great old truck. Excellent capture of this old truck but I really love the reflections you captured. Outstanding shot Linda, this is for sure a beauty! Super PoV and great looking vehicle obviously well looked after.